Dr. Edward Boshnick: "Over the years I've had the misfortune of examining hundreds of patients who have lost quality vision and suffered severe depression as a result of LASIK surgery. Two of these patients were so depressed by their post-surgical vision loss that they attempted suicide. In fact, there are several documented cases of post-lasik suicides." OSN Supersite 5/19/2009: Dr. Lawless said his practice has amended its essential clause to include language about the risk of possible psychological damage from an ideal or less-than-ideal refractive surgery procedure in response to last year's U.S. Food and Drug Administration panel meeting on LASIK safety, which examined quality-of-life issues as well as reported psychological damage resulting from poor LASIK outcomes in patients. We are presenting this information because people, particularly prospective LASIK patients, need to know that LASIK complications may have a profound negative impact on quality of life. If you are experiencing depression or suicidal thoughts after LASIK, please get professional help. If you are in crises and need immediate help, click here, call 1-800-273-8255, or call 911. Want to share your feelings with others who've been there and understand? Join the discussion on FaceBook. If you experienced a bad outcome from LASIK with associated depression or thoughts of suicide, please file a MedWatch report with the FDA online. Alternatively, you may call FDA at 1-800-FDA-1088 to report by telephone, download the paper form and either fax it to 1-800-FDA-0178 or mail it to the address shown at the bottom of page 3, or download the MedWatcher Mobile App for reporting LASIK problems to the FDA using a smart phone or tablet. Read a sample of LASIK injury reports currently on file with the FDA. ARE YOU CONSIDERING LASIK OR ANOTHER FORM OF VISION CORRECTION SURGERY? Please consider this. There have been several Lasik-related suicides and countless anecdotal reports of Lasik-related depression, anxiety, and post-traumatic stress. In 2008, the FDA called a special public hearing on Lasik after injured Lasik patients complained to the agency. In the weeks leading up to the hearing, the media reported stories of Lasik-related suicides and poor outcomes. At the hearing, leading Lasik surgeons, in a concerted effort to protect the public perception of Lasik, lined up to testify that Lasik cannot lead to depression or suicide. The Lasik industry even hired a psychiatrist, Jennifer Morse, MD, to testify that patients who are depressed after Lasik were already depressed before Lasik, and that there is no scientific evidence of any direct link between Lasik and depression or suicide. Morse was even quoted in an October, 2008 issue of EyeWorld magazine saying that unhappy Lasik patients have good Lasik results but defective brains (David Laber. Depressed patients can struggle coping with post-Lasik. EyeWorld. October 2008.). Physicians in every other medical specialty must acknowledge and address surgical complications or face lawsuits, discipline by state medical boards, and loss of medical license. In the field of Lasik, surgeons readily lie to protect themselves, their colleagues, and the Lasik gravy train. Below is a link to a February, 2016 review of the body of medical literature on surgical complications (all types of surgery) and their impact on patients’ psychosocial well-being. The conclusion states, "Surgical complications appear to be a significant and often long-term predictor of patient postoperative psychosocial outcomes. The results highlight the importance of attending to patients’ psychological needs in the aftermath of surgical complications." Be warned, if you experience problems after laser eye surgery, your surgeon will almost certainly downplay or dismiss your concerns. If you continue to complain, you will likely be met with animosity and eventual abandonment. Because Lasik is completely unnecessary and carries significant risk to a vital sensory organ, the Lasik industry will do whatever is necessary to conceal the problems. Please read the following article and consider the psychological toll that surgical complications take on patients. Lasik is no different. Are you willing to accept this hidden risk of Lasik? Pinto et al. Surgical complications and their impact on patients’ psychosocial well-being: a systematic review and meta-analysis. BMJ Open. 2016 Feb 16;6(2):e007224. From the article: The suicide note Tim Fentem wrote contained an apology and an explanation. From the article: A month before taking her own life Dec. 12, Jessica Starr, a meteorologist for a Detroit TV station, shared that she was still struggling with complications such as dry eyes and blurred vision from her Lasik-type eye surgery in October. Watch video that Jessica Starr posted on Facebook shortly before her death. From the article: After enduring debilitating eye pain for more than two decades, an Ontario man took his own life in what his family says was an act of desperation to end the suffering caused by complications from laser eye surgery. Webmaster's review of the article: A 19 year old man underwent LASIK in both eyes. Three days later he reported blurred vision and underwent surgery to lift his flaps and irrigate the flap-corneal interface. Five days later he was treated for high intraocular pressure (IOP). One month after LASIK surgery, he sought treatment at another eye clinic for loss of vision (legal blindness) and eye pain. He was diagnosed with, and treated for, extremely high IOP and fluid accumulation under the LASIK flaps. Thirty days later the man's vision had partially improved, and his IOP had come down, and the fluid in the interface had resolved. However, 3 months later he had developed epithelial ingrowth (cells growing under the flap), cataracts in both eyes, and glaucoma. Months later his IOP was elevated again and his vision had dropped. He was surgically implanted with a glaucoma valve in both eyes. The man was referred to a psychiatrist because he was severely depressed and attempted suicide. Source: Cabral-Macias et al. Pressure-induced stromal keratopathy after laser in situ keratomileusis: Acute and late-onset presentations. J Cataract Refract Surg. 2018 Oct;44(10):1284-1290. Webmaster's review of the article: A young man underwent laser eye surgery for myopia on both eyes. A few weeks after seemingly successful surgery the man became severely depressed and went to the emergency ward of an eye clinic. He was upset by the visual outcome of his surgery and complained of dryness and irritation. He was prescribed lubricating drops and ointments. A few weeks later the man again went to the eye clinic at night in a dire state of depression and reported that his vision was interfering with his ability to function. He was advised to try glasses. The man went to the eye clinic again a few weeks later, again during the middle of the night, again severely depressed. He was offered psychological counseling, which he declined. He left the clinic promising to return the next morning, but he never returned. He committed suicide. Source: Setten, G. (2015) Suicide after Excimer Laser Refractive Surgery: On the Importance of Matching Expectations. Open Journal of Ophthalmology, 5, 145-148. doi: 10.4236/ojoph.2015.53022. Had Lasik surgery in 2001, at [redacted by FDA] y/o and "was a perfect candidate" doctor [redacted by FDA] said. Had severe corneal ectasia went blind after. Had corneal transplant in 2003. Lens implanted in 2004. Many subsequent surgeries since. Lasik completely destroyed my life. I have lost years of work as a deputy sheriff and was taken off the street due to vision. I have held my service revolver to my head several times contemplating suicide. I have daily debilitating headaches and severe dry eyes. I have even had my blood made in eye serum drops out of desperation for my eyes. Nothing works including many specialty contact fitting attempts. I am more suicidal than ever and know it will happen when I get the courage to do so. The Lasik doctors knew this surgery was extremely dangerous but didn't care because it was a billion dollar industry. They lied to the FDA minimizing the side effects (the FDA board chairman who approved Lasik later testified to this) and complications of this surgery. LasikPlus informed me the worst side effect of this surgery was slight glare and dry eyes which would go away within a year. That was blatant lie and they knew it. Six years post-LASIK, my wife was diagnosed with corneal ectasia after developing severe headaches, severe dry eye, and severe eye pain and vision problems (distortions, halo, extreme photosensitivity, shadows, ghostings, loss of night vision, and more); she lost her job as an IT professional because she was unable to perform duties as a result of these issues, developed severe depression and anxiety and was suicidal; she has not recovered emotionally from the catastrophic outcome of this procedure. Conroy MA, Duran PA, Avery JD. A Case of New-Onset Psychosis Following Laser In Situ Keratomileusis (LASIK) Eye Surgery. Prim Care Companion CNS Disord. 2016 Sep 22;18(5). Excerpt: Visual changes after laser in situ keratomileusis (LASIK) surgery leading to patient dissatisfaction, such as decreased contrast sensitivity, poor distance vision, glare, and halos, are well described in the literature. Although there is a plethora of community forums and individual testimonies describing the development of depressive symptoms in reaction to post-LASIK visual changes, there is a paucity of published reports describing mental health sequelae following this procedure. Furthermore, no literature to our knowledge has described the development of psychosis following LASIK surgery. We report the case of a man who developed first-onset psychotic symptoms following the procedure. Theophanous et al. Corneal Neuralgia after LASIK. Optom Vis Sci. 2015 Jul 3. Excerpt: A 42-year-old man with a history of [high cholesterol] underwent LASIK [in both eyes]. He presented to Boston Foundation for Sight (BFS) 10 months later with a detailed timeline of his own clinical course as follows: Immediately after the procedure, he had a burning sensation in both eyes. Within several weeks, he had noted symptoms of light sensitivity, halo effect, and extreme dry eye. He was initially treated with topical cyclosporine (Restasis, Allergan, Irvine, CA) twice per day, preservative-free lubricating drops throughout the day, and punctal occlusion. These measures substantially reduced his symptoms in the left eye by 2 to 3 months after LASIK; symptoms in the right eye persisted with notation of continued achy, sore pain with tearing that worsened throughout the day, sensitivity to sunlight, blurriness, and dryness. His symptoms in the right eye were subsequently treated with warm compresses twice per day, moisture chamber goggles during the day, ointment thrice per day and nightly, oral cetirizine, trial of bandage soft lenses, and a daytime eye patch, offering limited relief. Doxycycline 100 mg by mouth daily was also prescribed for mild blepharitis. During this treatment period, the patient developed depression and ultimately was hospitalized for suicidal ideation, which he reported was driven by his eye pain. I had Lasik 5 years back and it burns like "profanity". Feel I should commit suicide, got conjunctivitis and the conditions worsened. I'm fed up, using tears natural and a steroid. Please help. Editor's note: In April, 2016, we learned the identity of this suicide victim through his mother who reached out to us. In the hopes of preventing another tragedy, she has decided to share her son's story. Read In Memory of Max Cronin. Hitomi Terada, 60, told a news conference on Wednesday that she has suffered from consistent burning pain and has to apply a cooling pad every few minutes just to cope. “I can’t open my eyes like before and I have contemplated killing myself,” she said. Editor's note: Dr. Steve Schallhorn, Optical Express Chief Medical Director, has denied any link between a bad outcome from LASIK and suicide. In a 2008 newspaper article on LASIK-related suicides, Schallhorn was quoted as saying, "There's no cause and effect". Learn more about Schallhorn in this Lasik News Wire article. Although LASIK is not mentioned in this video, Steve Holcomb suffered complications of LASIK surgery, which led to his 2007 suicide attempt according to Holcomb's book. LASIK surgeons routinely misdiagnose post-LASIK ectasia as "keratoconus" in an effort to keep a lid on this growing epidemic. (Note: The corrective procedures that Holcomb underwent are currently experimental and not FDA-approved for post-LASIK eyes). Excerpt from Holcomb's book: I had worn contacts and glasses for years and thought nothing of it. A lot of my friends and both my parents wore corrective lenses, so it wasn't a big deal, except when bobsledding... You can wear contacts, but it's not ideal given the amount of jostling you endure. But this was about to change during my first year in bobsledding. A local eye surgeon came to the U.S. Olympic Training Center in Lake Placid and offered free Lasik procedures... After a quick screening it was determined that I would be a great candidate, and so I took advantage of it... "When can I get back to work and see some results?" I asked... "You should see a real difference in about six weeks, no more than eight." That had been a year ago, and not only was I not seeing better, but my vision kept getting worse. Steven Holcomb was found dead at the age of 37 in his room at the U.S. Olympic Training Center in Lake Placid, New York, on Saturday, May 6, 2017. I had lasik eye surgery at Lasik Plus and my life hasn't been the same since. Suicidal and etc. now. I have chronic aqueous deficient dry eye aka neurotrophic keratopathy or refractory dry eye. My eyes do not tear when they are dry or come into contact with irritants and allergens. This is an extremely painful and degenerative condition though I don't think I will be around to see exactly how bad it gets because I intend to end my life soon. My doctor claims that it is not possible for this to be a result of LASIK. However, when pressed he said that up to 40% of LASIK patients have some degree of residual dry eye. He is full of contradictions. It depends what you're asking him and in what context. The answer changes regularly. It took me 6 years to find a doctor that finally told me that this condition is in fact due to LASIK surgery. This is due to a concerted effort by ophthalmologists to cover up for each other. Even though they knew better they sent me on a 6 year quest to find out what I should have been told before the surgery. LASIK causes extreme dry eyes in many people, especially people like me with high risk factors. "My one and only child committed suicide after 1.5 years of struggle with bad Lasik job. He was only 22. His night vision became very poor. Please have FDA pull this off the market at all cost. How many people have to die?" This procedure ruined my life. It left me with severe dry eyes. Corneal erosions. Starburst and halos at night. My night vision is ruined and I have vitreous detachment in both eyes. The non stop pain caused me to attempt suicide at age 32. I lost my job, house car and future. This could of easily been prevented if I was given proper VERBAL warning about 3 conditions that SHOULD of eliminated me from the procedure. I went to The Lasik Vision Institute. Warning to all. I had lasik surgery on (b)(6) 2007. The surgery was performed within 4 hrs. of my initial visit. I have not had clear vision since the day of surgery. My problems include dry eyes, halos, starbursts, no contrast ability, lack of peripheal vision, extreme sensitivity to light, and now bilateral cataracts. I was told at every visit that these complications would resolve over time. Of anything, my symptoms have become worse. I faced an unknown amount of surgeries to remove the cataracts and I am concerned about the instability of my corneas, which have been damaged and will at some point require corneal transplantation. At the time of my surgery, I was earning in excess of (b)(6) per year. Due to my declining visual ability and debilitating depression, I am on (b)(6), wherein I receive a monthly stipend of (b)(6). I have attempted suicide more than 5 times since my lasik. "Ashu", a 31-year-old doctor of psychiatry from Michigan, had LASIK in the summer of 2003 and committed suicide on September 15, 2004. Ashu was a graduate of the University of Michigan medical school with a bright, promising future. He had searched extensively for a surgical fix for his LASIK complications, and he had traveled to see an optometrist who specializes in fitting therapeutic contact lenses. On January 16, 2012, Morris Waxler, former FDA chief of ophthalmic devices, reported the suicide of 28 year-old Vincent Wat of Las Vegas to the FDA commissioner, Margaret Hamburg, M.D., and the director of the FDA's Center for Devices and Radiological Health, Jeffrey Shuren, M.D., J.D. Several LASIK patients had communicated with Wat under his Internet pseudonym "notsubby" on a LASIK patient online forum where he had expressed thoughts of suicide. Although Wat died on September 2, 2008, the LASIK patient advocacy community was not aware of his death until late 2011. LASIK patients who had communicated with Wat located his friends and a family member, who confirmed the information surrounding his LASIK-related suicide. "DO NOT HAVE LASIK SURGERY! Tell the media!!!" Read Todd Krouner's slides (see slides 6 through 8). May 28, 2011: 20/20 Hindsight on Canada's GlobalTV program 16:9 The Bigger Picture features Larry Campbell's story as told by his son. From the article: "'He went for a walk and my brother though it was strange because he usually always took his dog with him but he didn't take his dog with him on this walk. He didn't come back, and my brother, obviously feared the worst,' says Roger Pedretti, Robert’s older brother. On that February day four years ago Robert Pedretti ended his life with a blast from his shotgun... 'I was around him all the time and despite reading afterwards the degree to which he was suffering he, I think tried as much as he possibly could to look like his normal self.' But inside, Robert was dealing with a job change, depression, and health problems. 'I didn't know his eyes were burning to the extent because of Lasik eye surgery or his ears were ringing.' Therapist, Dr. Joel Rooney says that combination, for a man, at that age can be lethal... Now his family has his memories, and his writings, which have given them insight into his suffering. 'He said it was like a cancer, like a terminal illness that you just couldn't get through and the pain was too much to overcome it he couldn't live that way anymore,' says his brother." From the article: "While many patients achieve satisfactory outcomes, Dorrian began experiencing debilitating visual aberrations following surgery, such as glare, double-vision or ghosting, blurred vision, halos, and impaired night and low-light vision." "Gerry Dorian said his son consulted many specialists and closely followed developments in the technology, hoping for a breakthrough that could reverse the damage. Colin took his own life after concluding “that wasn’t going to happen,” Gerry Dorrian said." "Colin left a message on his computer indicating he would kill himself if he couldn’t get his vision corrected, Gerry Dorrian said." From the article: "[LASIK] Patients go to their ophthalmologists, some of them suicidal because of the pain, and their eyes on the slit lamp look perfectly normal," said Perry Rosenthal, M.D., founder, Boston Foundation for Sight. "Doctors send them to a psychiatrist because they think the [patients are] exaggerating. It just adds to the patients' burden." Before you dismiss this patient as a crazy hypochondriac and send her on her way, consider corneal neuropathic disease, an extremely rare condition that causes intense pain along corneal nerves. 4/25/2008 Diana Zuckerman, PhD, President, National Research Center for Women & Families wants more information about the Emory study of suicide rate among cornea donors (Go to 4:44). Dr. Zuckerman: "The possibility of a higher suicide rate among [LASIK] patients has been raised and will be raised. More research and really good quality objective scientific research is needed. I tried to get that information. I contacted Emory University but was not able to get better information about that research which, it has not been published." Excerpt: "My life as a respected Police officer and my hobbies of fishing, scuba diving, surfing, working out at the gym, bicycling and living my life happily are now over and its been all Doom and Gloom for me and I have even considered suicide but a very close and loving friend has kept me from doing this. I would rather go blind and live in pain and anguish than to not see her again. At least that's what I feel today but I came very close a few different nights." From the article: Colin Dorrian was a promising law school student when he sought relief from a chronic dry eye condition by undergoing Lasik laser eye surgery. However, rather than improving his vision and freeing him from his contacts, the procedure left him with so much eye pain and fuzzy vision that after six years, he took his own life... Dorrian, who ended his own life six years after having Lasik surgery, should have been disqualified from having the surgery. His pupils were overly large, and he suffered from extreme dryness of the eyes—two conditions that should have disqualified him from having the procedure. And yet he was cleared for it. From the article: "Frustration and even sorrow can follow any unsuccessful surgery, but when the procedure leaves a patient with unremitting eye pain or permanently impaired vision, the emotional toll can be particularly severe... Scientists at the Emory Eye Center in Atlanta reviewed suicides among organ donors who had had laser eye surgery. Preliminary results suggested the suicide rate might be four times as high among cornea donors who had had lasik as among cornea donors who had not... Christine Sindt, an optometrist and associate professor of clinical ophthalmology at the University of Iowa in Iowa City, Iowa, has encountered the psychological effects that patients experience when they have trouble seeing. "Depression is a problem for any patient with a chronic vision problem," she said. But in the case of post-lasik patients, she said, the depression is compounded by remorse. "It's not just that they lose vision," she said. "They paid somebody [who] took their vision away." Sindt specializes in treating ectasia, a bulging of the eye that is considered the most severe and rarest LASIK complication. She sees a few dozen patients with ectasia; all of them show signs of depression, she said." From the article: "The cornea is the most powerful pain generator in the human body, said Dr. Rosenthal. The density of corneal pain receptors has been estimated to be 40 times that of dental pulp. He explained that the damaged nerve fibers in the cornea, the sensory fibers, cause all the symptoms, whether or not the initial disease is severe dry eye or corneal neuropathy. Source: Miriam Karmel. Addressing the Pain of Corneal Neuropathy. EyeNet, Jul/Aug 2010. From the abstract: A total of 517 responses were submitted. After exclusion criteria, 392 responses were coded resulting in 36 separate subjective complaint categories. 195/392 (50%) responded to the three follow-up questions. 58 subjects reported suicidal ideation as a result of the surgical procedure, and 83% (48/58) of this group were referred to as successes by their surgeon. 115 subjects reported severe depression as a result of the surgical procedure, and 76% (87/115) of this group were referred to as successes by their surgeon. 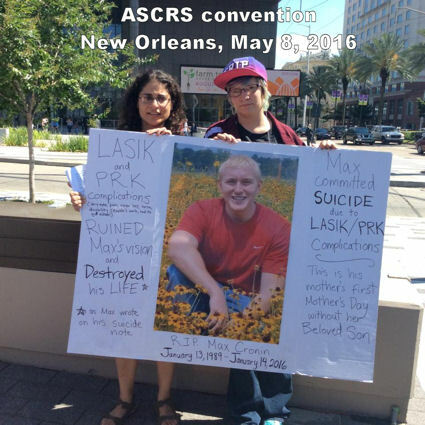 How does the LASIK industry respond to reports of LASIK-related depression and suicide? “There's no cause and effect.” Schallhorn, Steven C.
As quoted by Vollmer, S. "Some link depression, failed LASIK." News & Observer [Charlotte, NC] 3 February, 2008. "It would be an error to conclude that poor results of LASIK are the cause of suicide." R. Doyle Stulting, MD. (2008, March 5) Letter to the Chicago Tribune from Richard Lindstrom. Watch Parag Majmudar, M.D. 's performance as "Dr. I. M. Suicial" at a convention of the American Society of Cataract and Refractive Surgery (ASCRS), singing of "pushing the boundaries of ethics". Below, skip to 42 seconds to watch comedy skit starring Dr. I. M. Suicial (Parag Majmudar, M.D. ), William Trattler, M.D. and Jodi Luchs, M.D. Lam BL, Christ SL, Lee DJ, Zheng DD, Arheart KL. Reported visual impairment and risk of suicide: the 1986-1996 national health interview surveys. Arch Ophthalmol. 2008 Jul;126(7):975-80. Increased mortality risks also have been noted in adults with visual impairment and disabling eye disease... However, reported visual impairment indirectly increased suicide risk significantly by 5% through poor self-rated health and by 12% through the number of nonocular conditions. The combined indirect effects of reported visual impairment operating jointly through poorer self-rated health and a higher number of reported nonocular conditions increased the risk of suicide significantly by 18%. When we examined the combined indirect effects of the other covariates in the model, only older age produced stronger associations, providing further support for the importance of the indirect effects of visual impairment as a contributor to increased risk of suicide... Up to two-thirds of people who commit suicide have some type of physician contact in their last month, and physician education is effective in reducing suicide rates... In summary, we observed that reported visual impairment increased suicide risk, particularly indirectly via reported health status and health conditions. Cataract Refract Surg. 2006 Oct;32(10):1775-6. A 46-year-old woman was admitted with complaints of severe dry-eye symptoms, blurred and double vision, halos around objects, and inability to look at oncoming car lights. She had had excimer laser surgery 2 years earlier for myopia, which she said was around −10.00 diopters (D) and −11.50 D in the right and left eyes, respectively... Severe dry eye and visual disturbances due to a mid-dilated pupil were diagnosed. The prescription included frequent instillation of artificial tears and pilocarpine drops 4 times daily. Punctum plugs were also advised, but the patient did not want another ocular procedure. She called the office 4 days later from a psychiatry clinic where she was hospitalized because of intolerable visual disturbances resulting from longstanding pupil dilation. The patient did not return for a follow-up visit. A 34-year-old woman reported dryness of the eyes and visual disturbances after LASIK 11 months earlier. According to her statements, the refraction in her spectacles was approximately −8.00 D and −7.00 D. She was receiving antidepressant therapy with seroxate; one reason she had LASIK was to improve her mood and increase her self-confidence. She reported that the result of the surgery was a “catastrophe,” “worse than anything I could imagine,” and that “life became a burden” for her. Posted on Wednesday, 23 May 2001, at 8:13 p.m.
Excerpt: I cannot battle this anymore, there is no current and there will be no future hope for me. I am so sad that my life has been stolen from me this way. How did this nightmare happen? Is this real? Did I really do this to myself? How did my eyes end up so screwed?...My pain now is not from my eyes, but from the thoughts of how devasted my family will be from this. I made the biggest mistake of my life, the biggest mistake ANYONE COULD POSSIBLY make. In one instant my life was destroyed and now my family and friends will suffer to. I only hope that they know this is to end my suffering. Tuisku I, Tervo T, Belmonte C.: "It is important to comprehend that these individuals may be suffering from “phantom eye pain,” which does not have a psychiatric or “central pain” etiology. The recent discussion of mental depression up to suicide after LASIK suggests that we need to pay more attention to the pain issue after this therapy and analyze whether this problem is associated with unrealistic expectations, poor results, or development of peripheral neuropathic pain." Source: Letters to the Editor. J Refract Surg. Oct 2008, pg 772. From the article: He had the eye surgery in December and had to put in eye drops every day for three months to regain the strength in his eyes. He could see, but not well enough... He saw an eye doctor who recommended the LASIK surgery, but Tyre still wasn’t sure. “I had my disbeliefs,” Tyre said. “Some people say you see halos around car lights and there’s only a 50 percent chance it works. But my doctor assured me that with my young age, it wasn’t as bad as it could be.” “I couldn’t pick up the rotation or spin on the ball,” Tyre said. “It was real depressing." From the article: Dealing with a sense so delicate and wondrous as sight was a little different than trying to shake off a sprain... Since his 2007 Lasik surgery, McCann’s eyes had changed. He didn’t really begin to notice, he said, until the start of this season. But the change was drastic... “Until we got the two eyes equalized, it was not going to be better,” said Alan Kozarsky, the Atlanta ophthalmologist who did the Lasik, and one of several doctors on the case this month... The McCann boys had been taught early by their father to play through most any injury. But this was something else. There was no gutting out this type of problem... “I was more concerned with him mentally,” McCann’s father said. “He was miserable."